Almost everywhere on the railway had telegraph facilities. Some had separate offices and dealt with both railway and GPO messages. Ambergate station would have had an office looking similar to the one in the photo; while railway facilities would have been available in many signalboxes and other offices. Below are extracts from a Midland Railway "List of Telegraph Stations" book published in 1912 showing the entries for Ambergate and Whatstandwell stations. The code "CD" appears in the Postal Stations" column against Whatstandwell Sidings. 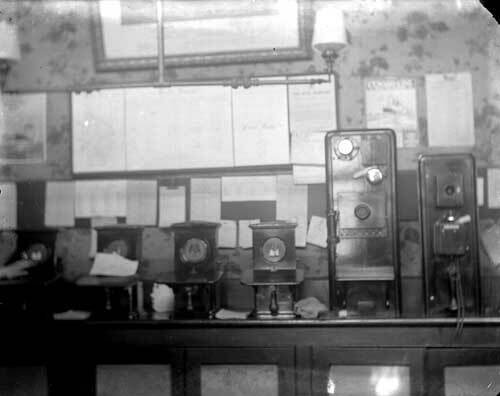 This meant that it was open for the collection and general delivery of public telegrams. I would think that these were passed from and to members of the public at the stations and then transferred by one of the porters as I can't imagine people being allowed in the signalbox. 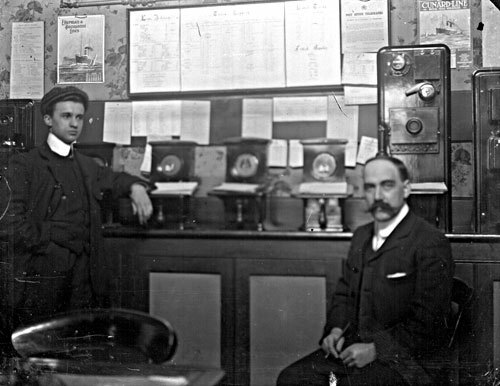 The code "CD*" against Ambergate meant that they were open for the collection and delivery of messages on the station (i.e. the facility was on the station). The dagger to the left of the name “Ambergate” stated "when closed telegrams dealt with at Station box". 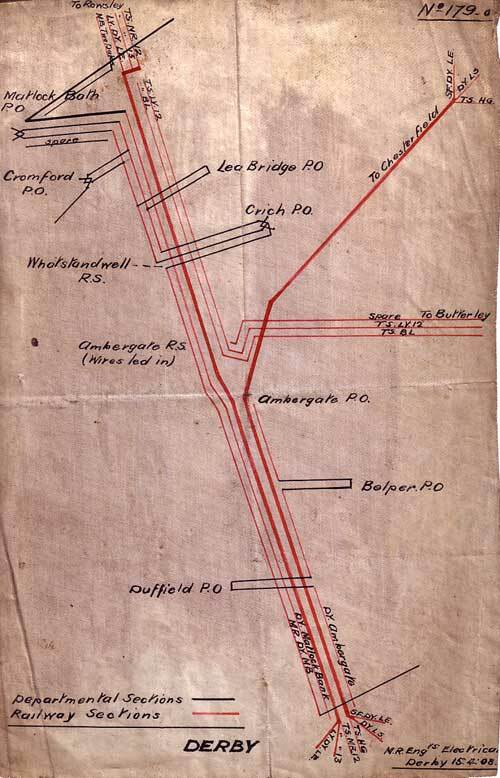 Below is a Midland Railway diagram drawn in 1908 showing railway telegraph routes, with various offshoots to Post Offices, one of which is Crich. The instruments on the cupboard shelf are single needle telegraph instruments for sending and receiving telegraphic messages, known as the 'speaking telegraph'. On each instrument you have a note pad shelf and operating handle. Also, on the second instrument from the right you can make out the two slopping 'sounders' with the needle in the centre. As well as watching the needle swing left and right to read the message you could also listen to it as the needle struck the sounders. There are two telphones on the right-hand side. The extreme right telephone design has two pieces: a microphone box above and below this a so-called switch-bell, i.e. bellset combined with switchhook and receiver. The phone is a design of the 1880s. The telephone on the left, the taller of the two, is a pure GPO (not railway) design; probably the Tele. 18. It was fully universal and could be used for battery or magneto ringing, or for central battery working. Pretty certain it is 1890s. Note the polar relay near the top of the backboard and the trembler bell, which shows us this one was on a DC-ringing omnibus circuit. Amazingly these phones survived in the Irish Republic until the last few decades. Telegraph offices were recorded in the various directories of the time. Below is the entry from Kelly's Directory of 1899. Post &; M. O. 0., S B. &; Insurance &; Annuity Office. Whatstandwell Bridge.–John Bowmer, sub-postmaster Letters arrive from Matlock Bath at 6.20 a.m & 2.59 p.m.; dispatched at 11·30 a.m. &; 7 p.m. The nearest telegraph office is at Whatstandwell railway station. Post Office, Fritchley.–Thomas Davidson, sub·postmaster. 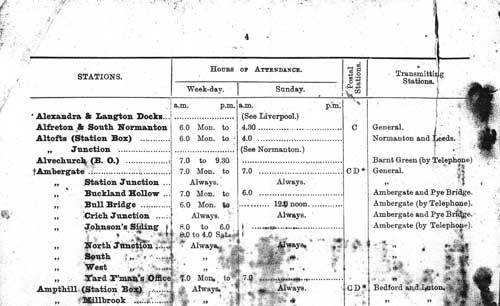 Letters through Derby, via Ambergate, arrive at 7.30 a.m. &; 4.45 p.m.; dispatched at 9.45 a.m. & 6.20 p.m. Postal orders are issued. here, but not paid. The nearest money order &; telegraph office is at Crich, 2 miles distant.